Now, usually, a plot that runs in place isn’t a problem for a daytime soap opera, a genre that can go for months without anything happening in particular. Soap operas don’t need plane crashes and giant spider invasions; they have other people’s houses. The audience gathers to catch a glimpse of life as she is lived, in the mansion down the street. Characters clump up into groups and have conversations, and arguments, and emergency surgery. They hand each other alcohol, and reflect on their predicaments. I know, it doesn’t sound like it would work, but the genre ruled the waves for decades, only going into decline because the country ran out of housewives. 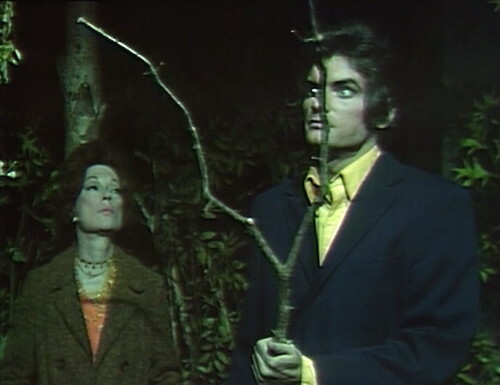 The problem is that Dark Shadows is now an adventure story, populated by characters who are entirely plot-specific. A soap opera is supposed to be a continuing story, where you watch an ensemble of characters grow and evolve. People fall in love, marry, have children, cheat on each other, get addicted to things, and swap their own babies with other people’s babies. Ideally, the stories emerge naturally from the interplay of the characters, with multiple storylines crossing over as the various cast members interact in real time. But Dark Shadows has become an anthology series, splitting into an entirely separate new chapter every three to five months, like American Horror Story, except it’s not an allegory for anything. It just is what it is, for as long as it lasts. So they’ve stopped caring about human lives and relationships; the characters only have the interests and feelings and characteristics required to move the plot forward. This style kicked in around a year ago, at the beginning of the Leviathan story, when Carolyn — a character with zero previous interest in retail — was suddenly struck with an all-consuming desire to temp at an antiques shop. The shop was cramped and dark, the owners were erratic and irritable, and she didn’t need the money, but all of a sudden she couldn’t wait to sell people dusty crap, ten to twelve hours a day. Now that the shop’s burned down and the story’s over, Carolyn is unemployed again, and she doesn’t care. And then there’s Quentin — originally a character with more secrets and relationships and storylines than anyone outside a Dickens novel — now drifting along without a job, a girlfriend, or any particular purpose. He’s just Quentin, the hot immortal guy who lives in Collinwood and talks to people. When there isn’t enough plot — and it’s painfully thin, right now — then everybody has to get along on their personal charm. That’s fine for Quentin and Julia, who could coast forever. But we’ve also got a couple of annoying kids, and then there are the ghosts, who make me want to kill myself. The current plot involves a pair of silent specters, Gerard and Daphne, who lurk in the shadows and appear in people’s dreams. They’ve got a past, somewhere in the background, where presumably there’s an explanation for who they are and what they want, but at the moment they’re a mystery, and the writers are taking advantage of it by really skimping on the ghost motivations. For example: Daphne, the ghost. She’s been seducing Quentin in his dreams, drawing him in with a one-two combination of perfume and prettiness. He doesn’t really know anything about her, except that she’s dead, but Quentin will make out with just about anything; that’s what he’s for. So Daphne lures Quentin right out of the house, to a silent rendezvous in the cemetery. He reaches out and folds this wisp of unsolid self-awareness in his strong, masculine arms, and reels her in for a kiss. Then she raises a pointy dagger behind his back, triggering a cliffhanger that kicks the can down the road until tomorrow’s episode. And this surprises her, somehow and for some reason, and she lowers the knife. She turns away, looking thoughtful, as if she’s touched by his gallant declaration. Which is fine, except she’s the one who’s incepting him with these feelings in the first place. Why would she hypnotize a guy into loving her, and then be surprised when he tells her that he loves her? I mean, explain that. Explain any part of that. And I know, “mystery”, but there’s a point where it’s not mystery, it’s just being lazy. The writers are making things up as they go along, so it’s okay with me if they haven’t figured out the story arc yet, but if the viewer can’t follow the scene from one moment to the next, then why do it at all? Daphne hands Quentin notes and journals filled with cryptic and menacing phrases. Then she glad-eyes him out to the graveyard, and wields cutlery. I have no idea what she’s trying to do. Daphne is super annoying. Meanwhile, the kids, who could hardly be worse. The ghosts have been batting David and Hallie around all week, encouraging them to put on silly clothes, look at toys, and then act like it’s a terrifying secret. The results have been mixed, at best. So here’s a scene where David comes to Hallie’s room, and finds her swanning around in the same dress that she’s been putting on and taking off for as long as I can remember. It doesn’t do anything. It’s a dress. Hallie, who used to be frightened by this, is now super excited to wear it, and David, who used to think this stuff was exciting, is now frightened. She tells him to come in quickly and shut the door, so that nobody sees her in the dress. “Just what?” Hallie demands. “Has something happened that you haven’t told me?” Like what? But he makes a shocking confession — when he went to his room, he found some old clothes on his bed. She insists that he put them on, but he doesn’t want to. “You don’t want to make me happy!” she yells. “You don’t want to make her happy!” And then she storms out of the room, into the hallway. I thought she didn’t want anybody to see her. But that was seventy seconds ago, and these kids change their motivations and personalities at least once per scene. It’s exhausting. Downstairs, Quentin’s doing his own flip-flop. He was just outside, dallying with the dead, and all of a sudden he wants to get rid of the ghosts. 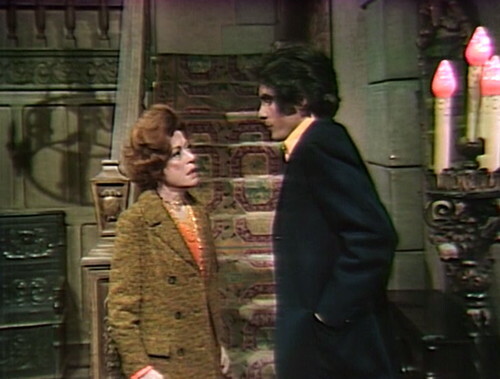 “If there are spirits in this house,” he declares, “we not only owe it to ourselves, but to them, to put them at rest once and for all — by exorcising them from this house!” This is what people talk about on Dark Shadows. And then the camera pulls in really, really tight, and then even tighter, so all you see are his eyes, his nose, and maybe fifteen percent of his cheek. They’ve been doing this a lot since they came back from 1995; I have no idea why. It looks awful. There’s even been a couple scenes where they pull in this tight on both people in the scene, and they cut back and forth between them, and all you can see is part of their face. Maybe they’re trying to save money on scenery. Okay, more drama. David finds Hallie in the playroom as usual, and she’s terribly upset, quelle surprise. Here’s the lowdown. 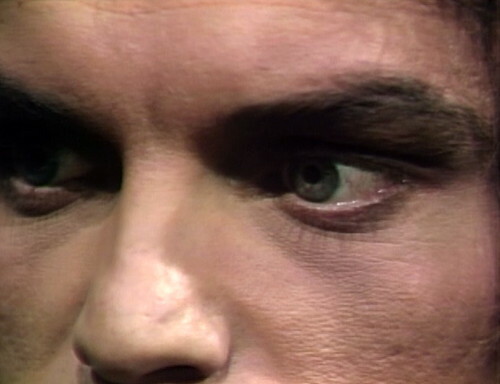 And then they pull in for another intrusive closeup, which isn’t quite as close as Quentin’s but it’s plenty close. My preference is to move further away from Hallie; I don’t know who made this request. David: Nothing you’re saying is making any sense! Yeah, no kidding. If you’re going to incept someone, why incept them with this? Then Daphne comes in, and boy, is she angry. She stares at Hallie with almost as much contempt as I feel for her, and that’s plenty. Hallie shivers and gulps, and asks Daphne not to punish her. Why would Daphne be angry at something that somebody else did, 130 years ago? I’m really not following this very well. Back downstairs, Quentin’s gone out and found a big stick to use for the closing number. “No!” Quentin declares. “We don’t need him. I know what to do.” That means we don’t want to pay him to appear, and it’s a dumb scene anyway. “If the ceremony is a success, there may be a severe disturbance in this house after it’s over.” Okay. So they go outside with the stick, and Quentin looks off into the distance and starts talking. To start with, he abjures them, contemptuous and evil spirits, by the judge of the quick and the dead, by the maker of all things, and by him who hath power to put them into hell. Then he asks them to depart in haste from the confines of this house. This is all standard boilerplate. Furthermore, he tells the restless and unquiet shades — also doing business as the creatures of those nethermost pits where the fire is not quenched — to return to their winding sheets, and set the living free, in the name of the Lord. Now we’re getting somewhere. Also, he wants the alien spirits, the defilers of innocence, and the persecutors of virtue to cast themselves back into the outer darkness from whence they came. Then there’s some theremin music, and Quentin looks weird, and that’s the whole thing. It doesn’t work. So the problem is that we’ve seen all of this before — louder, faster and with weirder characters. Once you’ve seen a Trask exorcism, or a Stokes Saturday-night special, you can’t be satisfied with a regular stick party. Plus, we’ve seen spirits who are way more contemptuous and evil than these. And I wouldn’t call this defiling innocence or persecuting virtue, either. When you get right down to it, it’s basically dress-up; the only surprise is that the kids don’t have a tea set. Quentin can waggle his stick all day, if he wants to. We’re still not getting anywhere. When David enters the playroom and approaches Hallie, you can see a studio light reflected in the window glass. At the beginning of act 4, as Hallie sits up, someone crosses in front of the camera. Julia is clearly struggling for her lines in act 4. The worst line: “Quentin — (sigh) — those spirits — must have — been aware — when you did the — the exorcism, and they — they committed a minor — accident.” When they cut to Quentin, he’s biting his lip, possibly to keep from laughing. Ken McEwen performs the voiceover narration at the beginning of the episode today; he was an associate director who played Larry Chase in five Parallel Time episodes back in May. He performs the narration for three episodes — 1028, 1079 and 1082 — and he doesn’t play a character in any of them. Hallie falls down in this episode and hurts her arm, and by act 4, she’s got her arm in a sling. Kathy Cody was actually hurt; she was hit by a car outside the Dark Shadows studio. Reading your transcription of Julia’s line I almost committed a minor accident. They must have really been trying to save money for the rest of the series, because those tight close ups continue being used throughout 1840. The sets for outside Collinwood have been reducing. Danny’s noted earlier that the storylines and characters are almost entirely Collinwood-based now. The only exception I can think of is 1970 Parallel Time and Cyrus’s Jekyll and Hyde, which only got involved with Collinwood when Yaeger took a fascination with Maggie Collins (when that particular thread was entering its endgame). Everything outside gradually reducing, until there is only Collinwood. It’s the Nothing encroaching. I blame Atreyu. Or Bastian. Or the Childlike Empress. There was an interview segment, though, where the interview subject stated that an actress from the show hurt her arm on a studio door, and they wrote the injury into the show. Or maybe a car door. Is it the same injury? Or did Henesy do it? Plausible. No, it was that stupid black paper shadow! It has a few mostly archaic meanings, including one from the 1800’s — “to graduate from a university with an academic degree” — which wouldn’t apply here unless David and Hallie are earning a degree in how to dress as, and become, proper ghosts! Another definition — “to receive as a member” — could possibly fit this particular situation Danny’s describing, i.e., spirits of the dead possessing the living, in which David and Hallie are on a path to join Daphne and Gerard as members of an exclusive ghostly club by becoming Tad and Carrie. Saito: "If you can steal an idea from someone's mind, why can't you plant one there instead?" Arthur: "Okay, here's me planting an idea in your head: I say to you, 'Don't think about elephants.' What are you thinking about?" Given Danny’s interest in sci-fi, I’m guessing this 2010 sci-fi film might be what Danny’s referencing here by his use of the word “incept” to describe Daphne’s manipulations of the minds of the three characters, Quentin, Hallie and David. Yes, it’s a reference to Inception. I didn’t realize that it would be so obscure, because lately I’ve been talking with some friends at work about incepting our boss with ideas about a coming reorg. I guess that’s just part of my vocabulary now. I appreciate everyone’s hard work in deciphering what the hell I’m talking about. We’ll just have to keep up. Having gotten heavily into Rick & Morty of late, i was all up on the inceptions and incepting. You know — there had been rumors for years that Quentin had a big stick. Now we know it’s true. Julia: “Is that a big stick in your pocket, Quentin, or are you just happy to see me? Tom Jennings, Chris Jennings and definitely adam! That’s true but, Barnabas’ Willie isn’t always willing. So that’s what Barnabas does in his coffin all day! Nah, he only rises after dark. Julia: Barnabas? Barnabas! What’s going on in there? You’ve been in there all day! Barnabas: Nothing! Wait until sunset! Don’t open the lid, I’ll be out in a minute! Can’t a vampire get a little privacy? So that’s why Barnabas always needs a lot of blood. He keeps using it for Barney Jr.
Quentin’s using a dowsing wand to exorcise Collinwood? I must admit to some… confusion on this point. I went to the fount of all knowledge, the Internet, to see if this was actually “a thing”; I found out that it is believed that a dowse may be used to find water, mineral deposits, gems, or buried bodies (in fact, it was used in 1986 in Norway in an attempt to find soldiers buried in an avalanche). Many studies have been made of the phenomenon, resulting in its dismissal as a pseudoscience. I remember that in 1795 Reverend Trask used a dowsing wand to find the witch – this does have some provenance, as divining rods were used in 17th century France to seek criminals and heretics – and though the practice was considered to be satanic, perhaps the good Reverend felt that he needed to use evil to root out evil. The stick is also known as a witch wand, lending further credibility to Trask’s employment of such a method. But how would Quentin have come up with something like this as a tool for exorcism? There is no lore that I can find that says that the Virgula Divina has a such a use. No wonder it didn’t work. May we hope that he at least found one of the many unmarked graves on the estate? Or at least a rich vein of copper? How about someone’s lost fountain pen! As far as I’m concerned, an antique fountain pen or a motor part — say a bleeder valve for brakes, for instance — are viable instruments to use in exorcising ghosts from Collinwood. And the nuclear option: Mrs. Johnson’s boiled dinners. Threaten ghosts with that and see if they show up again. That’s right – and we’re still baffled by their inexplicable failure to utilize the much vaunted exorcism power of the pigweasel! He needs a bell, a book, and a candle, and Collinwood is full of things like that. Well, the human body is mostly water, isn’t it? I guess you could dowse for anybody. My uncle’s body was mostly Walter, but he got an operation and now is mostly my Aunt Willa. 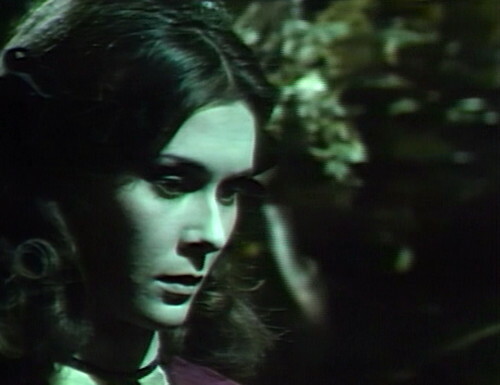 Off topic for this episode, I recently watched #465, which ends with Barnabas and Vicky (under his control) driving to the mausoleum and she sees Peter on the road and then the car crashes. I never noticed before, but the footage of Peter on the road is an actual filmed outside shot- not taped in the studio. Interesting that at this point they still were doing this when the last exterior shot was pre-1795. Not to be disagreeable, but I disagree that the footage was filmed outdoors in that episode. Looks like studio video to me. There’s no law against filming indoors. But Robert will agree, there should be a law against using the words film and tape in this day. Fifty years ago, DS broke new ground by going to videotape. As did other shows. And then there was this new show. Our parents wouldn’t let us watch it. No, not “Soap”, but that was the groundbreaker as well. “All in the Family” made taping a network show the cool thing to do. But in this day, we shouldn’t even use the words tape or film…. Unless we’re using tape or film. Please don’t tell me I now have to parse out the appropriate use of “film” vs. “tape” – I have enough trouble keeping up as it is. Oh, I was a real stickler back in the day, probably because my first professional job in television was that of videotape editor. I used to cringe when people would confuse film and video/videotape. Nowadays, even I say “filming” for one-camera video shoots because we no longer shoot on videotape; it sounds weird to say “We’ll be video-ing the scene tomorrow,” because it doesn’t sound professional. We could say, “We’re recording the scene tomorrow,” but some folks my think we’re doing an audio recording. Besides, movies and prime time TV shows that have the “film look” are actually shot on video, so that muddies the water even more. The way I always tried to explain the different looks of video vs. film was that video looks live, like a newscast. 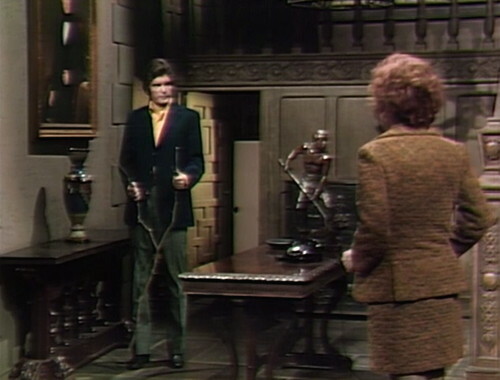 Dark Shadows wasn’t the first show to be videotaped; it was among many. I think you are correct that All in the Family was the first sitcom to be videotaped. When I first saw it, I thought it was a comedy sketch on one of the variety shows. So I asked for Janet Findlay and I get Quentin with big stick doing the wrong ritual. 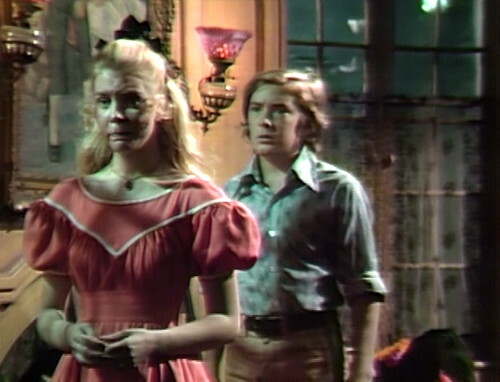 Part of the oddness of this section of the show is that, hoping for better days, the writers are deliberately recalling the Quentin-and-Beth haunting, only vaguely trying a variation by shifting the scariness to the girlghost: where a scary Quentin was apparently trying to recreate Jamison and Rachel Drummond with intimidation and period costume distribution, here it’s frowny-stare-murder-note-dropping Kate Jackson dressing up the teens and luring Quentin to become . . .um, Quentin? They must have been counting on fan recall to give this an additional measure of felt logic, but, as Danny makes clear, episode for episode, scene for scene, moment to moment, it’s a set of disconnected gestures and attitudes–and, worse, none of it will match anything in 1840 once we get there. I can’t pretend to be shocked–the wind-down of the PT Angelique story was even more random writerly strawgrasping than this–but when you’re ostensibly following two plotting agendas at once (prepping us with accumulating hints about 1840 and fulfilling senile Carolyn’s cryptic list) you shouldn’t have to be spitballing your scares like this. At least with Quentin’s haunting there seemed to be a reason for it, getting revenge for being killed and sealed up in his room. This one has no reason at all. The reasons for their hauntings will be left up to speculation. It’s never clear as to why Gerard wants revenge. Now we will discover that there is someone else who has a major bone to pick with the Collins family from way back and who would be very happy about the destruction of the house and the family. But that’s to be discovered in 1840, and it still doesn’t make sense as to why the ghosts of Gerard, Daphne, Tad, and Carrie are hating the mansion; or what triggered them during 1970 for that matter. And yet, in spite of poor writing, memorization issues and maybe even a morale problem among the cast (? ), there is something about Dark Shadows that draws us like a moth to the flame. I’m pretty sure it isn’t that Quentin has a big stick, because we were hooked long before that. It’s the Burke Devlin Special. One sip and you’re hooked for 1225 episodes plus comics, audios, bubble gum cards, novelty joke books etc. Wouldn’t it have made more sense if the ghost of Judah was haunting Collinwood, and perhaps possessing someone from 1970? Was Judah so disabled (due to the decapitation thing) that he had to possess Gerard’s ghost? That must be a first for a horror story: a spirit possessing a someone else’s ghost. It isn’t even Gerard doing all this, it’s a ghost possessed by another ghost? Gerard isn’t even really Gerard when he’s not possessed by Judah. He’s Ivan Miller using a fake name. I don’t think the writer’s even thought of Judah yet, unless they (or Judah in terms of the story) are using Gerard as a “red herring” to disguise the real person behind everything. Thank the Maker they DID use Gerard instead of Judah in 1970 – Gerard is way cuter! Surprise-a-Spook; it’s like Confuse-a-Cat for ghosts. And this surprises her, somehow and for some reason, and she lowers the knife. The first time I saw this scene, I was hoping Quentin would knock Daphne down like cartoon James West did in a similar situation in the opening credits of Seasons 2 through 4 of The Wild Wild West. Does Daphne know Quentin is indestructible? It would be funny if she had attempted to stab him and done a bewildered double-take at how ineffective that turned out to be. LOL! That would be so funny! But is he indestructible? I was never sure about the portrait thing. I mean he doesn’t age, but he was buried alive once (and it could happen again). It was implied that if he wasn’t rescued, he’d die. As a 7th grader watching all of this back in 1970, I was constantly saying, “But, but, but….” because the writers couldn’t remember jack. My impression was that in the timeline where he was walled up, the enchanted portrait didn’t get painted. I think Daphne’s surprised because Quentin is being kind to her. She’s trying to make him fall romantically in love with her, that obsessive “I must have you!” kind of love, so that he’ll be in her thrall. She didn’t expect a deep, unselfish love. Maybe this is her first experience with it. When I first glanced at the photo at the top, I thought that was Bruno, not Quentin.